My friend Adam was recently upgrading an Epiphone Strat copy (which we’ll be covering in the next blog post) and asked if I could help him with a somewhat unorthodox wiring idea. 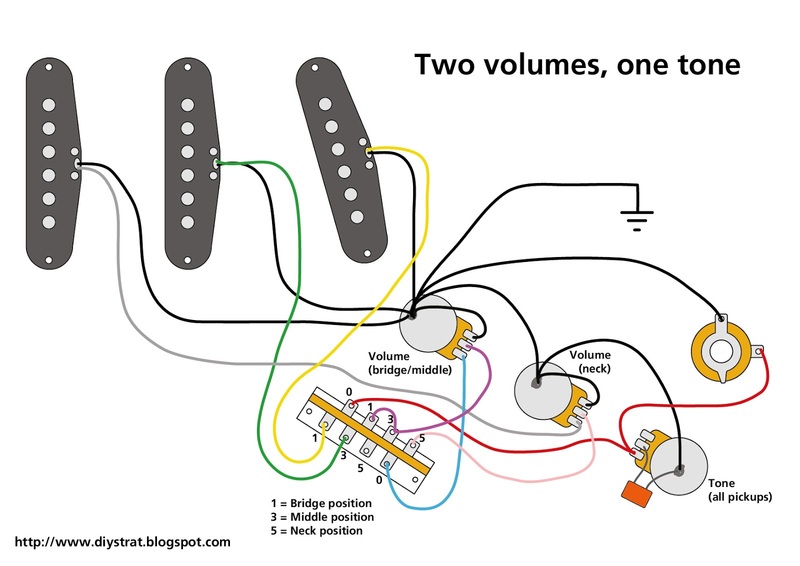 So, continuing on somewhat from the previous post about the Stratocaster 5-way switch, today we’re going to look at how to wire up a Strat so that it has two volume controls and one tone control. To quote Adam: "I want to rewire my Strat so that I have two volume controls and only one tone control. I want the knob nearest the strings to control the volume for the bridge and middle pickups, the middle knob to control the volume for the neck pick up and the knob furthest away from the strings to be a master tone control. " I couldn’t find much on Google about anyone else doing this, at least not without using a super switch, but I was pretty sure it could be done. So this is what I came up with. Click on the image to enlarge it. In the bridge position, pin 1 (bridge) is connected to pin 0 (common) on both sides. The yellow wire from the bridge pickup goes to pin 1 and the signal then continues to pin 0 on the left side of the switch. This then connects to the bridge/middle volume control via the blue wire. Additionally, the purple wire from that volume control comes back to pins 3 and 1 on the right side of the switch and this then passes to pin 0 on that side since it is currently connected to pin 1. Pin 0 then connects to the tone control through the red wire and continues to the output jack. In the middle position, pin 3 (middle) is connected to pin 0 (common) on both sides. The green wire from the middle pickup goes to pin 3 and the signal then continues to pin 0 on the left side of the switch. This then connects to the bridge/middle volume control via the blue wire as before. Additionally, the purple wire from the volume control comes back to pins 3 and 1 on the right side of the switch and this then passes to pin 0 on that side since it is currently connected to pin 3. Pin 0 then connects to the tone control through the red wire and continues to the output jack. In the neck position, pin 5 (neck) is connected to pin 0 (common) on both sides. However, the neck pickup wiring is quite different from the other two pickups. The grey wire from the neck pickup goes directly to the neck volume control. It connects there no matter what position the switch is in, so you may wonder how that doesn’t affect the output even in the other switch positions, well, that’s because the pink wire coming OUT of the volume control connects to pin 5 of the switch and that doesn’t connect to anything unless the switch is in the neck position, at which time the signal can now continue to pin 0 on the right side of the switch. This then connects to the tone control through the red wire and continues to the output jack.